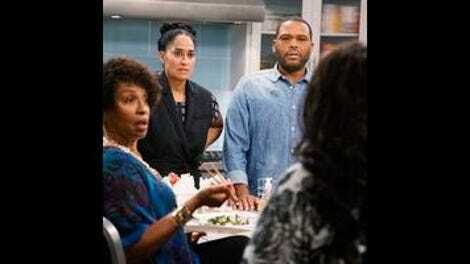 Pick a Black-ish side: Are you Team Johnson or Team Johnson? At this point in Black-ish’s existence, a line like that should really nip any Dre argument in the bud, automatically. Especially since those scenes at Stevens and Lido have officially reached a status of full-on crazypants (technical term)—and this episode terrifyingly showcases just how far gone everyone we know in that office really is. But somehow, Dre’s tunnel vision is always allowed to continue, and that’s how we get the A-plot of this week’s episode, “Johnson & Johnson,” and the extremes that it reaches. The meat of “Johnson & Johnson” is another ridiculously overblown Dre plot, as he doesn’t agree with the fact that Bow apparently didn’t take his last name in marriage… even though her maiden name is also “Johnson.” It’s clearly an absurd plot, as Bow constantly brings up that the names “Johnson” and “Johnson” are literally the same, but it’s one that’s near and dear to Dre’s heart regardless. What follows is a typical Dre plot, with Dre going on and on about tradition and the good old days and all those other things he holds in such high regard. Then along the way, the plot goes from loud and wacky to an actual conversation about the importance of a last name in a marriage and family—especially in the black community—and the differences that exist between “black feminism” and “white feminism”—instead of just a reason to mock Bow for being a feminist. The Carmichael Show has become the most talked about issue-based sitcom as of late, but as episodes like “Hope” have reminded us, Black-ish can undoubtedly do it with its own style too. And in the case of “Johnson & Johnson,” that style comes first in the form of a bait and switch, pretending that the point of the episode is much more shallow than it actually is. 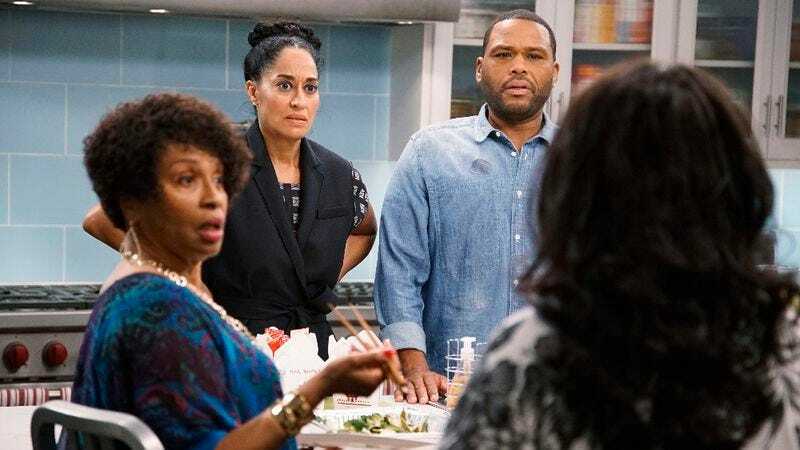 The kitchen scene between Bow, Dre, Ruby, and Rhonda (and eventually Zoey and Diane) is a shining moment of this episode, reminding the audience that Black-ish is more than just a funny family sitcom, with an actual conversation about the things that matter. Even Ruby, who is in full caricature moment this episode, contributes to the conversation instead of just tearing it down because of Bow, and Zoey and Diane also chime in appropriately in a way that both Dre and Bow probably should’ve just listened to in the first place. By the way, it’s odd hyphenation never really comes into play, considering Dre’s examples at work—Kim Kardashian and Beyonce—both use hyphenated names in their marriage. “Johnson-Johnson” is definitely the natural progression for Dre here. Basically, as much as it is old hat for Dre to be “so Dre” in these instances, it really does get old. It gets better in this episode, but the one-track-minded Dre that constantly exists has already turned off too many people who could otherwise be interested in the show, and it’s frustrating to those who do stick with show. I recently wrote about how The Carmichael Show isn’t afraid to make Jerrod Carmichael the “bad guy” in the discussions it has, and I’d also argue Black-ish does that in a way, in making Dre the fool. The problem is that that can often do more harm than good, especially since The Carmichael Show is far more subdued that Black-ish is or ever will be. In a show where “too much” is the baseline, taking that a step farther can only work in bursts—and Dre’s behavior is clearly more than just bursts. By the way, as I call Ruby “full caricature” this episode, that doesn’t negate the fact that this is a very good Ruby episode from both a humor and a character standpoint. It really helps that Ruby’s behavior regarding lesbians isn’t from a place of hate as much as it is general misunderstanding; it also speaks to just how seriously anyone can even take Ruby on a regular basis when she’s such a passionate person who refuses to actually make a stand for any of her passions. That even counts when her passion is looking up famous lesbians, since she denies doing that the moment Rhonda’s fiance Sharon (Elle Young) questions her on that. Zoey and Junior have minor bits—as this episode dovetails more, due to the end goal being Rhonda and Sharon’s wedding—trying to “fix” Ruby, but it’s ultimately something the woman does by herself, and that’s even better. It’s also important to note that even in the more serious segments, the episode is still very funny. Because as immature as the ping pong tournament is, it also provides the hilarious visual of Junior getting crushed by Sharon’s father (Phil Morris), simply because his ping pong skill doesn’t translate to actually playing against other people. In fact, Junior gets to be especially weird in this episode, as he reminds us all just how nerdy he is (without the usual computer or sci-fi/fantasy cues) and tries to dress to impress with constant costume changes. But at least he and Zoey get to have a little fun at Jack and Diane’s expense by making the younger kids question their cuteness. You got to keep younger siblings on their toes, even when their plot is the definition of inconsequential. Speaking of younger siblings, Raven-Symone’s return as Rhonda is a nice one based on how good she was in “Please Don’t Ask, Please Don’t Tell,” but this episode inadvertently makes something about her character stick out: If not for her presence in these two episodes so far, no one would really remember that Dre even has a little sister. Not only do the flashbacks to young Dre never feature her, a lot of Dre’s behavior in the present (and the way his parents interact with him) screams out only child, even though he’s not. It’s an odd aspect of a show that is actually quite good with its world-building, especially when the Rhonda character fits right in with the rest of the family and understandably gets Dre and Ruby’s neuroses. Also, based on these two episodes, Pops has yet to meet his daughter. My first note for the episode came as soon as I heard “Family Affair” at the beginning: “This show really is ‘black homework’.” Thank you for the words to describe that moment, W. Kamau Bell and Kevin Avery. I have a dream. My dream is that Lucy eventually sues Stevens and Lido and/or writes a tell-all, gets all of the money, then takes over Stevens and Lido and instead of firing them, makes everyone’s life a living hell. No one is safe! By the way, after the movie quiz beats, I’m really worried about Junior at this point. Also, I definitely had a denim jumpsuit in middle school, and it looked much better than whatever one Junior was trying to take to a gay wedding.